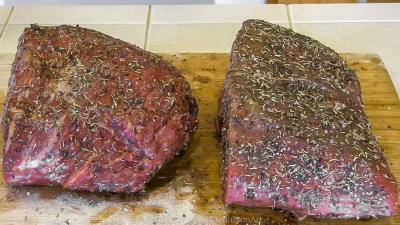 This is a very quick, easy but very tasty way to slow cook a cheaper beef cut known as the Beef Bottom Round Roast. Let's get started by trimming off the fat from the roasts. 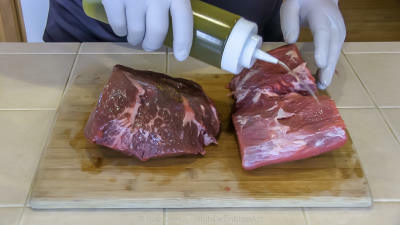 Next drizzle each roast with Extra Virgin Olive oil and then rub the oil in fully coating each roast. This will allow for the seasonings to adequately adhere to the meat. 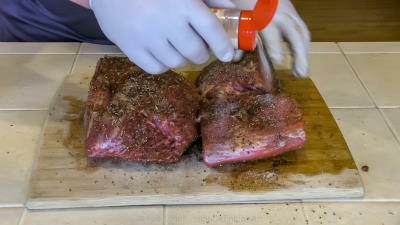 Once coated with oil, shake on a liberal coating of Mad Hunky Meats just Add Beef rub. Go ahead and put it on thick. Follow this with a liberal coating of coarse ground black pepper and Thyme. Shake on onion powder and coarse sea salt to your liking. Wrap the roasts up in plastic wrap and let them rest in the fridge for at least a couple hours. When I can I let them rest over night. 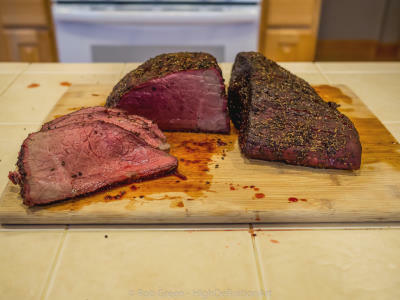 Once the roasts have rested and all the seasoning has had ample time to get that meat all happy, remove the roasts from the fridge and pre-heat your cooker. 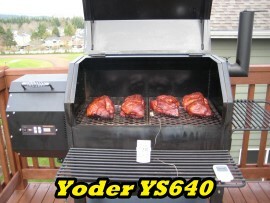 In my case I'm cooking on a Yoder Smokers YS640 burning Bear Mountain Forest Products Cascade Alder pellets. 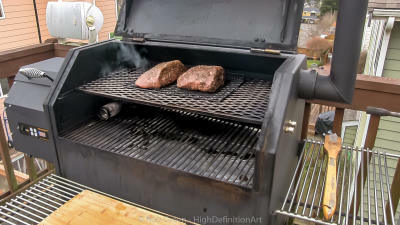 I am also augmenting the smoke buy burning the Cascade Alder pellets in the Amaze-N-tube-Smoker. This will add to the smoke flavor. I have pre-heated my cooker to 225° F.
Once your cooker is up to temp place the roasts into the center of the cooker. I recommend placing your roasts on a greased cooking rack and then placing them into the cooker. 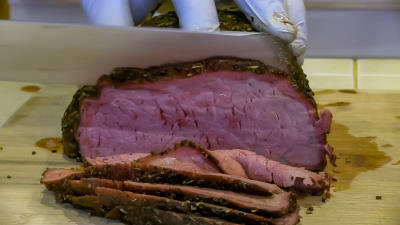 Cook the roasts @ 225° F until the internal temp reaches 137° F foe a medium rare roast. If you prefer a different doneness, see the beef doneness chart below.